The 10/100/1G/10G/40G/100G/200G/400G Ethernet Verification IP is compliant with IEEE 802.3 specifications and verifies MAC-to-PHY and PHY-to-MAC layer interfaces of designs with a 10/100/1G/5G/10G/25G/40G/50G/100G/200G/400G Ethernet interface. It can work with SystemVerilog,Vera, SystemC, E and Verilog HDL environment. 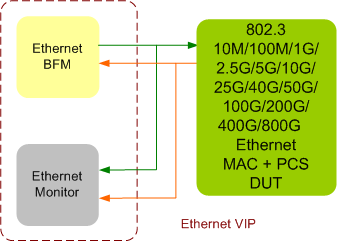 Ethernet VIP is developed by experts in Ethernet, who have developed ethernet products in companies like Intel, Cortina-Systems, Emulex, Cisco. We know what it takes to verify a ethenet product. SmartDV's Ethernet Verification env contains following. Complete regression suite (UNH) containing all the Ethernet testcases.